Shirley brings her weekly writing prompt to get writing that story! This is the exit to the car park where I park every day. That barrier is waist height, by the way, and rises as each car sticks in their parking ticket or the camera reads their numberplate. 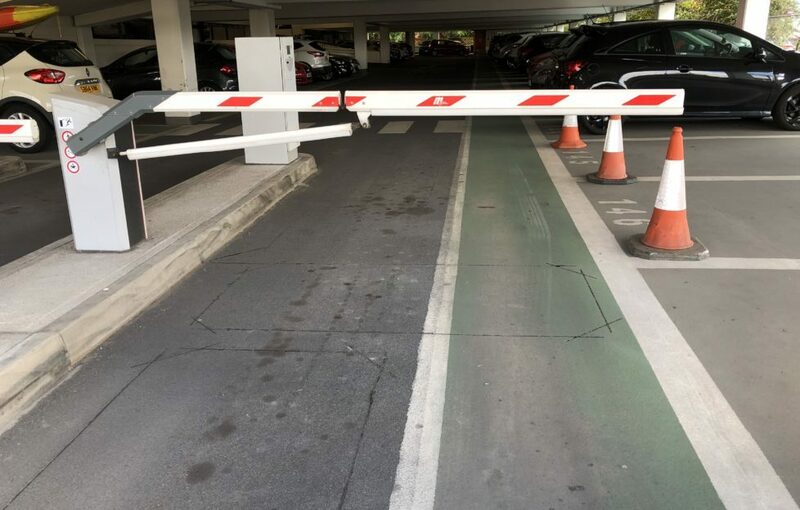 Note the pedestrian route carefully marked in green…under the barrier. Do you have to time your walk for when the barrier goes up? Dodging the exiting car at the same time? Maybe. The top one of those warning signs on the support at the left is to watch it doesn’t clonk you on the head as it descends! Do you limbo under it? Who knows? Anyway, what do you think the story theme is? But I want to go back to that “limbo” idea, and combine it with another little bit of stimulus. We received a number of story submissions recently from an aspiring writer. And the business card included was interesting. It lists their skills, talents, qualifications…. Driving Instructor Secretary – Shorthand, Fax, Telex, W.P. That’s quite a varied skill-set, isn’t it? And presented with a certain sense of achievement. Some might think, “Flea on a blanket” – ie can’t settle to anything. Perhaps they’re still finding their path in life. Perhaps they have a spirit of adventure. Hate to be tied down. Are just trying to earn an honest crust any which way they can. Maybe life keeps knocking them down and they keep bouncing back. Perhaps – and this is why I cited it here – they’re between life stages. In limbo.